Most of the epidermoid cysts arise in cerebellopontine angle or parasellar region. The uncommon location of presentation of epidermoid cyst is dipole of the skull. The overall estimated incidence of epidermoid cyst accounts to 0.2%–1.8% of intracranial tumors. Intradiploic epidermoid cysts are considered to be the inclusion of wrongly placed ectodermal embryonic tissue in neural groove or its vicinity  or may occur after trauma which results in implantation of epidermal cells into the bones. A 42-year-old female presented with a single episode of unprovoked generalized tonic–clonic seizures. Review of her history revealed on and off episodes of a frontal headache over a duration of 4 months and painless swelling in the left frontal region for 6 months. On examination, the patient was conscious, coherent and denied any history of trauma, fever, gait instability, and visual disturbances. Neurological examination was normal. Her history revealed benign meningioma 10 years ago, which was a well-circumscribed tumor and patient underwent left frontal craniotomy with complete resection of tumor followed by cranioplasty. Whole-body F-18 fluorodeoxyglucose (F-18 FDG) positron emission tomography/computed tomography (PET/CT) is done under the suspicion brain secondaries in a patient with a headache. Scan findings revealed non-FDG avid circumscribed hypodense lesion in the left frontal bone, measuring 2.3 cm × 3.0 cm. The lesion is causing the destruction of inner table of left frontal bone and extending intracranially with tumor to gray matter ratio (TGR) of 0.3, suggestive of intradiploic epidermoid [Figure 1] and [Figure 2]. Under general anesthesia, total excision of cyst was performed, and the defect formed by space-occupying lesion was repaired by cranioplasty. Histopathology of cystic lesion revealed areas of laminated keratin with no foci of calcification or hemorrhage, confirming benign epidermoid cyst [Figure 3]. Postoperative recovery was uneventful, and the patient was discharged on the 6th postoperative day. Epidermoid cysts are lytic lesions with the rim of sclerotic bone and may erode into inner and outer tables of skull.,,,, These cysts may rupture, bleed, and contents may spill into cerebrospinal fluid leading to aseptic meningitis., Cysts may spread along and compress surrounding structures resulting in facial and trigeminal palsy. Diagnosis is based on clinical examination followed by CT and magnetic resonance imaging (MRI) and histopathology. CT reveals size, extent of cyst, and dural infiltration. On MRI, cyst mostly shows heterogeneous signal intensity on T1-Weighted images and hyperintense on T2-weighted images  without any contrast enhancement. Intracranial extension of the cyst can be identified. F-18 FDG PET/CT normally shows non-FDG avid hypodense lesion in intradiploic cyst. It can differentiate enhancing tumors such as gliomas, meningiomas, metastatic tumors, central nervous system lymphoma from nonenhancing tumors such as dermoids, any radiation necrosis, based on FDG avidity and TGR. TGR is nearly 1.05 in enhancing tumors, 0.85 in recurrence and further less in dermoids and radiation necrosis. However, confirmation of diagnosis is based on histopathological findings. The differential diagnosis includes hydatid cyst, aneurysmal bone cyst, cavernous hemangioma, eosinophilic granuloma, and Langerhans histiocytosis. After proper surgical excision, the recurrence rate of 8.3%–25% has been reported. Intradiploic epidermoid cysts are rare. They can cause symptoms as they grow to a large size. Early evaluation including imaging followed by timely surgical resection is important to avoid potential complications. F-18 FDG PET/CT can be helpful in the differential diagnosis of intracranial lesions based on FDG avidity and tumor to gray matter ratio, thus improving the patient outcome. Ulrich J. Intracranial epidermoids. A study on their distribution and spread. J Neurosurg 1964;21:1051-8. Toglia JU, Netsky MG, Alexander E Jr. Epithelial (epidermoid) tumors of the cranium. Their common nature and pathogenesis. J Neurosurg 1965;23:384-93. Rao BD, Subrahmanyam MV, Prabhakar V. Giant intra-diploic epidermoids. Neurol India 1968;16:93-8. Pear BL. Epidermoid and dermoid sequestration cysts. Am J Roentgenol 1970;110:148-55. Guiard JM, Kien P, Colombani S, Caillé JM. Intradiploic epidermoid cysts in adults. CT contribution to diagnosis in 6 new cases. J Neuroradiol 1986;13:22-31. Arana E, Latorre FF, Revert A, Menor F, Riesgo P, Liaño F, et al. Intradiploic epidermoid cysts. Neuroradiology 1996;38:306-11. Ciappetta P, Artico M, Salvati M, Raco A, Gagliardi FM. Intradiploic epidermoid cysts of the skull: Report of 10 cases and review of the literature. Acta Neurochir (Wien) 1990;102:33-7. Kveton JF, Glasscock ME 3rd, Christiansen SG. Malignant degeneration of an epidermoid of the temporal bone. Otolaryngol Head Neck Surg 1986;94:633-6. Skandalakis JE, Godwin JT, Mabon RF. Epidermoid cyst of the skull; report of four cases and review of the literature. Surgery 1958;43:990-1001. Boyko OB, Scott JA, Muller J. Intradiploic epidermoid cyst of the skull: Case report. Neuroradiology 1994;36:226-7. Nager GT. Epidermoids involving the temporal bone: Clinical, radiological and pathological aspects. Laryngoscope 1975;85:1-21. White AK, Jenkins HA, Coker NJ. Intradiploic epidermoid cyst of the sphenoid wing. Arch Otolaryngol Head Neck Surg 1987;113:995-9. Di Chiro G, Hatazawa J, Katz DA, Rizzoli HV, De Michele DJ. Glucose utilization by intracranial meningiomas as an index of tumor aggressivity and probability of recurrence: A PET study. Radiology 1987;164:521-6. Cremerius U, Bares R, Weis J, Sabri O, Mull M, Schröder JM, et al. Fasting improves discrimination of grade 1 and atypical or malignant meningioma in FDG-PET. J Nucl Med 1997;38:26-30. Smirniotopoulos JG, Chiechi MV. Teratomas, dermoids, and epidermoids of the head and neck. Radiographics 1995;15:1437-55. Yanai Y, Tsuji R, Ohmori S, Tatara N, Kubota S, Nagashima C, et al. 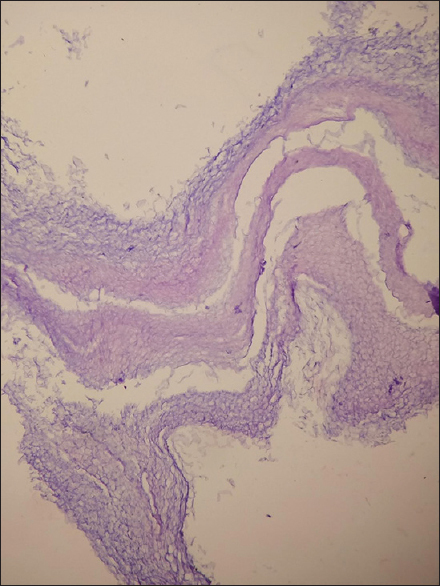 Malignant change in an intradiploic epidermoid: Report of a case and review of the literature. Neurosurgery 1985;16:252-6.